This summer, one of my goals is to read more. Like a lot more. On quilts in the backyard. With glasses of pink lemonade and happy straws. And I want to read more books for pleasure along with a few books that fall under my "I'll use this for teaching and other business things" category too. And then I thought of you and how you might be longing to read some new things too (both for pleasure and for "education") and thought it might be fun to compile a HUGE list of books we'd recommend to others for summer reading. In the comments: Share a book or two that you really recommend. Meaning you loved it! Meaning you would tell your best friend to ger her hands on it right now! Meaning you couldn't put it down and carried it around for days (or didn't move until you finished it). 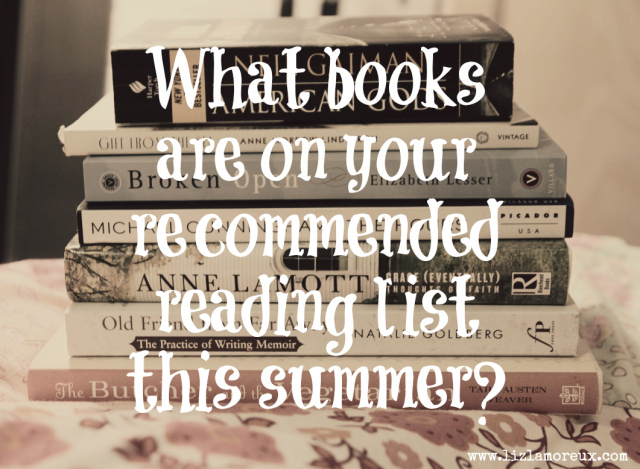 Then in early June, I'll create a blog post with a big long reference list of recommended summer reading that we can all turn to again and again this summer (even on our phones when we are browsing the library or in the bookstore). Can't wait! Updated: I'm so excited about all the suggestions already!!!! When you leave a comment, it would be great if you would include the author and maybe even the general genre of you book, so the big list can include those details. For example, teen lit, sci-fi, self-help, poetry, and so on. Thank you!